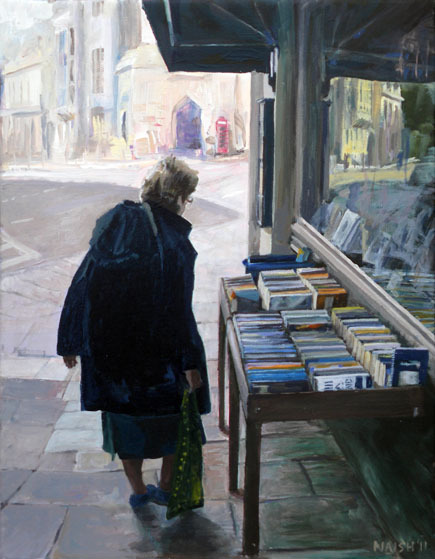 If you prefer that’s “Mum in Bradford upon Avon” or just “Book Browser”. I think the title is now locked down as the piece has now been accepted at the Hertford Open Exhibition and the label will state “The Book Browser” also its published as such on this web site. Does public display make that decision final? Probably, but I wouldn’t place money on it. The picture itself was from a short break to Bradford upon Avon with my mother. I just liked the composition in the photo that I took; - though I had to edit out a lady walking into shot from the left who was very in focus and very distracting; and also a car again breaking the tranquillity in from the left. I liked the dark framing elements and the beguiling extra information in the window reflection. Indeed a second figure is seen only in the reflection down a distant street. My mother herself sees this as a portrait- I’d never actually seen this in that way though the figure’s attitude is certainly appropriate to a character description which my mum herself has described as accurate. I just fancied the image and it grew into what you see above. Hope that you like it.